The village of Maleme, with about 550 inhabitants, is located at a distance of 17 km. west of Hania. Before the Second World War this was the site of the Hania aorport, where in 1941 the villagers took part in the "Battle of Crete" trying to keep parachutists from invading the island. Today, Maleme is very much developed as a tourist resort, attracting great numbers of visitors during the summer months. From Maleme you have easy access to the Kafkales site, where you will see the ruins of a hatched grave dating from the later minoan period, as well as the German Cemetary. Online Travel guide with the best accommodation in Maleme. Find the cheapest hotels is Maleme & get exclusive online deals. Great rooms at bargain prices. Book online now! Compare Hotel Prices and read Reviews from others. 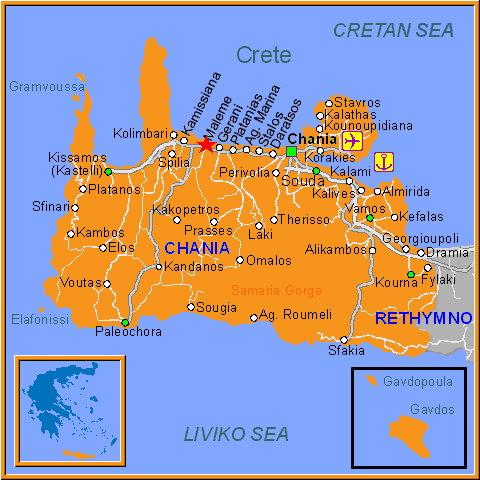 Great Hotel rates and information See photos, reviews & what's nearby Maleme . Detailed tourist and travel information about hotels of Maleme providing also regional information.